Back in the day, Guts the Black Swordsman was a top slayer for The Band of the Hawk, an elite mercenary unit led by Griffith, whose calm demeanor and callow beauty belied his fighting prowess and steel will. While in a king's employ, the attraction between the king's daughter and Griffith and the growing favor of the king towards the Hawk leader raises the hackles of the king's jealous son, who plots to have Griffith summarily assassinated. But if the plot fails, the king's son will likely have to deal with Guts and his titanic broadsword, and the results of such confrontations are rarely pretty... or easy to clean up. 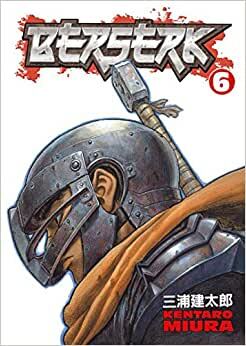 Start reading Berserk Volume 6 on your Kindle in under a minute. If you already got this far, then there's no reason to tell you that you need to buy more! But I refuse! The more money you give Miura, the more he plays Idolm@ster, at this rate the series will never be completed!! 5.0 out of 5 starsAmazing story!!! This is one of my favorite anime series of all time. Finding out it has a manga with more story and more content made my year. The story is riveting and developed. The pace is steady and the villains are amazingly evil. I'm thoroughly enjoying my read of this manga.